Here is my final set of cards to play along with Taylor's anniversary celebration!! Woohoo! I can't believe I got all 9 done, especially since I've been in such a slump lately! Both of today's cards used the DCWV Nana's Nursery paper pads. Specifically the Baby Girl and Baby Boy pads respectively. 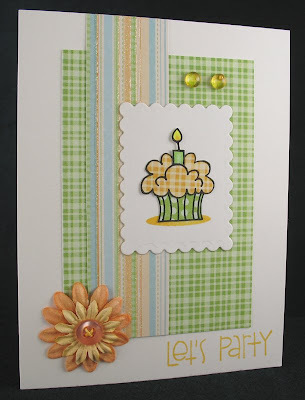 This first one used the sketch from Jami Sibley and features a brand new image from Stamping Bella called Cuppycake with a Huggabug on Top. How cute is she?! The sentiment is from Papertrey Ink. Now that I'm looking at the sketch again, I can see that my card's a bit off. I guess when I copied the sketch to work off of, I drew it wrong! Oh well, I think it's pretty close! 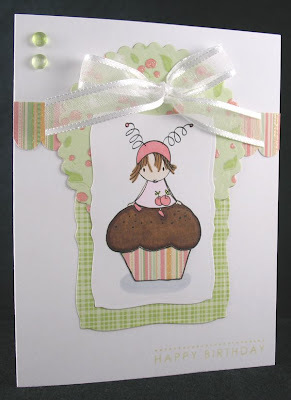 And here's my final card for the cupcake challenges, which used the sketch from Ana Wohlfahrt. I finally got around to using this Kim Hughes' set, Birthday Bash, that I've had sitting around for a while. I paper pieced the cupcake and liner, and then cut out an extra candle to pop up for dimension. The little shadow was done with an oval stamp from A Muse. I hope you've enjoyed seeing my cupcake creations! A big thanks to Taylor and all of her designers for the challenges - I had a ton of fun playing with cupcakes! This huggabug is just too cute! Great card! Hello Kitty Heart Card and an Award!